The county of Kukes is composed of the Has, Kukes, and Tropoje districts. It shares its eastern border with Serbia, while Montenegro and the Republic of Macedonia neighbor the county to the northeast and southeast, respectively. Albania's well-known hospitality was proudly exemplified in the late 1990s by Kukes City, which during the Kosovo conflict sheltered 150,000 refugees. It is the first town ever to have been nominated for the Nobel Peace Prize, in 2000. The city is in the mountains of northern Albania, near the Serbian border. In the 1970s, the town was relocated, as part of a new hydroelectric scheme, and in 1976, the old town was submerged in an artificial lake. The new town (Kukesi i Ri) is built on a nearby plateau, surrounded by the man-made Fierza lake. The town has the scenic beauty of the snowy Gjallica mountain as a natural backdrop. It has been made accessible to other parts of Albania by the construction of three bridges. Attempts to establish a tourist industry in Kukes have largely failed. The city is impoverished, with a small population, and a reputation for criminality. However, road connections have improved and the crime rate has dropped. 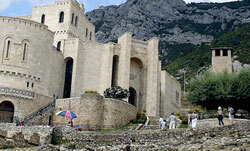 The city's main attractions are its mosque, and the Illyrian tombs in the nearby town of Keneta. Fishing and hiking in the nearby mountains is a favourite pastime. The city is semi-permanently blanketed in rain clouds, and receives gusts of Bora wind.